This is a simple procedure performed in a clinic office to help with prognosis and diagnosis in Sjögren's syndrome. A trained pathologist will review the gland to see if there are signs of Sjögren's syndrome in inflammatory cells. The pathologist may also identify the possibility of other diseases. The doctor identifies a minor salivary gland located in the lower lip. 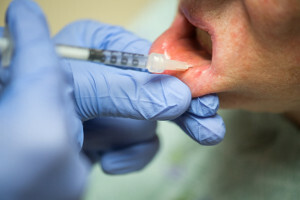 The doctor injects a drug to numb the area of the lower lip that has the most glands. The doctor makes a small incision, taking care to avoid damage to small nerves and blood vessels. The gland sticks out and the doctor uses forceps to remove the gland. The doctor closes the incision with an absorbable suture. Patients might experience discomfort, which usually improves after 1 to 2 days. Other complications are rare and can including bleeding, fainting, bruising, local numbness/tingling and the formation of a small nodule. Aftercare: Patients can take nonsteroidal anti-inflammatory agents (such as ibuprofen or naproxen) to help with discomfort and use a topical cooling like ice 15 minutes on and 15 minutes off applied to the outside of the lip.